Ed had never exhibited violence in the 30 years I’d known him so you can imagine my surprise when I was told he had assaulted an aid. Discomfort caused by lack of sleep, side effects from medications, or pain that the person is not able to describe. The surrounding environment, such as loud noises, busyness around the person, or clutter. Confusion caused by being asked too many questions at once, trying to understand complex instructions, or feeling the stress of caregivers. This was a traumatic experience for me. Here are the entries (from 2006) I made in my journal about this happening. These entries illustrate how distressing such a thing can be for the caregiver. June 26 Ed Becomes Violent: The unthinkable, unimaginable has happened. For the first time in the thirty years I have known Ed, he has been violent. He can have a very bad temper and yell a lot, but he has never so much as raised a finger to anyone. The Alois Center night nurse called me last night and told me Ed slapped an aid and then pulled her hair. Another employee went over to him and he let go. He told me the aid was not hurt, but I’m sure she was hurt and shocked emotionally. Anyone who knows Ed would be hurt and shocked, too and of course, I thought it was a horrible, inexcusable thing for him to do. The nurse said that Ed had been sitting in the dining room and there had been a lot of commotion in there, with employees loudly moving the tables and chairs around in preparation for a speaker that evening. He said he assumed that this had made Ed agitated. I am crestfallen and wonder if I will ever view Ed quite the same again. Down deep will I be afraid of him? Will I be ashamed of him? Will I feel ashamed on his behalf? Will I be angry at him? However, I must say that since he was never violent before, I can only assume it was caused by the illness and all the confusion in the dining room that night, and therefore was not at all within his control. I guess it’s like the Center’s social worker often told me: “Just when you come to terms with their state of illness and feel like you can handle it, they get worse.” Well – damn the illness. 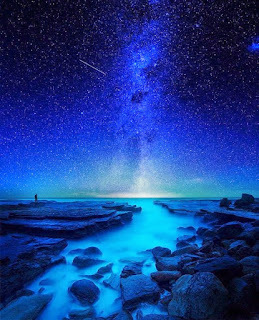 June 27 I Don’t Want to Visit: I’m very tired right now but will write a few words. I don’t want to go visit Ed now. I am angry at him even though I know he couldn’t help his violent behavior. Still, I feel like if I go there and I’m all sweet and loving, I’ll be condoning – or at least overlooking - his behavior. Also, I feel like the facility’s staff would think the same thing and have a bad opinion of me. June 28 New Light on the Situation: Last night the same nurse called me about an unrelated issue. While talking to him I brought up the issue of Ed’s violent behavior. He said not to worry about it. He said a lot of things were going on at the Center that evening, and many of the residents were upset and agitated. He said it was really their fault for not moving the residents back to their rooms before beginning to move the chairs and tables around. He said the Center considered Ed’s behavior a one-time incident, and didn’t feel it was necessary to follow-up on it in any way at this point. This has made me feel much better. I had even wondered if they would warn me that any more such aggressiveness might result in expelling him from the facility. I eventually did go to visit Ed after this event. And in all the 17 remaining months he lived at the Alois Center he was never violent again. 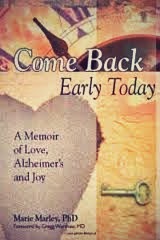 Marie Marley is the award-winning author of the uplifting book, Come Back Early Today: A Memoir of Love, Alzheimer’s and Joy.